Beautiful whitewash finish that allows the grain and knots of the timber to show through. A great way of adding extra storage space to any room of your home. 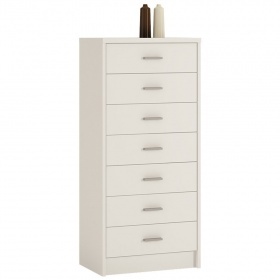 Two small drawers over four larger drawers provides you with plenty of organised storage space. 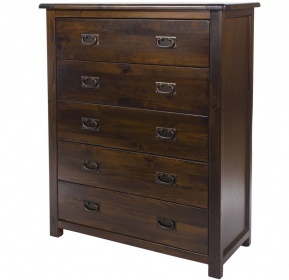 Easy glide metal drawer runners make it a pleasure to use the Terra chest of drawers. High build quality with metal drawer runners, FSC certified timber and finished with a hard-wearing white washed stain. The thickness of the chest are: sides:15 mm, front, top/base: 16 mm. Flat packed for easy self assembly. Full instructions included. Delivered in 1 box. Box size: L905 W408 H127 mm. One year manufacturers guarantee for added peace of mind. Part of the Terra merchants chest collection. 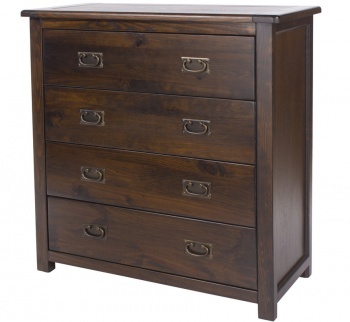 I wanted to buy the 2 +4 drawer unit but couldn't find any review on this item so I read some reviews on other furniture and felt happy to go ahead with my purchase. The set of drawers were the exact size I wanted ( not to deep ) and they fitted perfectly into the space provided. My partner did use extra glue on the drawers to make them more sturdy ( as I am a bit heavy handed) and after one coat of undercoat and one coat of gloss paint I am very pleased with the fininshed product. Would recommend this product. Also 2 of the drawer fronts had small defects on them but I sent an email and they were replaced with out any quibble and with out having to wait on the phone to speak to some one. Was not sure about the handles but against the gloss they look good.